Lemon Tea Tree Oil has a very tangy and citrus-like profile which delights the senses. Try and reach for this oil when the traditional aroma of the tea tree is too strong for you. There are people who do not prefer the medicinal aroma of regular tea tree oil. Lemon tea tree oil is extremely purifying and cleansing in nature. This oil supports overall wellness and is excellent to use during the winter season. Both a regular and a lemon scented tea tree oil is an important addition to your medicine cabinet. Just like a regular oil, lemon tea tree oil has the same amazing properties. Due to its fresh, lemon scent, you can even use it as a household cleaner. You can also use it to support skin health, in a variety of methods. As a warning: never try to take tea tree oil internally. Also, do not apply directly to lips, eyes or mucous membranes. It has a medium potential towards causing skin irritation. There are some people who have no reaction when they apply this oil directly on the skin. However, others experience severe reactions to it, therefore be cautious. Pregnant and nursing mothers should not use this oil without consulting with a doctor first. 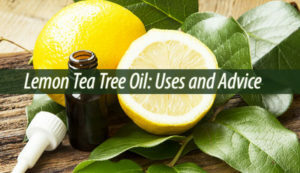 Lemon tea tree essential oil is distilled from a close relative of the tea tree. The oil has a pleasant lemon scent. Most describe it as a citronella or lemongrass fragrance. In low dosages, it can be very purifying and stimulating. It brings on relaxation, rejuvenating your mind. Lemon oil is also the ultimate mosquito repellent and not only. For example, when mixed with eucalyptus and cedarwood, it makes for a good flea repellent for dogs. Essential oils are not recommended to use for cats! You can add this oil into a bottle, filling it with water and spraying it around your house. It works great as an odour controller and leaves behind a pleasant smell.